Wetlands… When people hear this word, many are inclined to think of wastelands that only breed mosquitoes. To the contrary, wetlands are important habitats and nurseries for thousands of species of aquatic and terrestrial plants and animals. The benefits are many for both the environment and people. Under a Delegation Agreement, Pike County Conservation District administers DEP General Permits for various types of work in waterways, including wetlands and stream crossings, streambank stabilization, boat ramp and dock installation, intake and outfall structures and utility line crossings. If you are lucky enough to have a wetland on your property in Pike County, you may have seen species of turtles, frogs, snakes, waterfowl, fish, and mammals; and aquatic plants such as waterlilies, iris, arrowhead, and shrub willows in your wetland. Migrating birds use wetlands to rest and feed during migration, and as nesting sites when home. Wetlands provide flood protection by storing stormwater and releasing it slowly over time. Groundwater and stream recharge and the removal of pollutants are also functions of wetlands. Wetlands provide both recreation and aesthetic values as well as economic benefits through eco-tourism. Protecting wetlands can protect our safety and welfare. 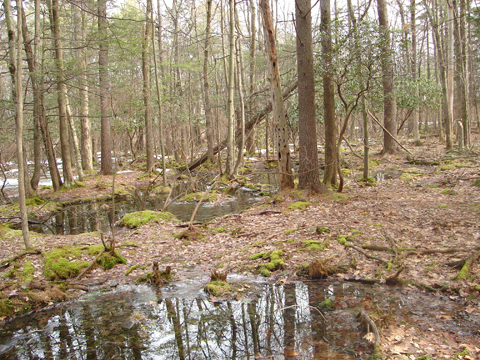 Pennsylvania lost an estimated 56% of its wetlands from 1780 through the mid 1980s. This can mostly be attributed to pond and lake formation, agriculture and land development with related pollutant release, and groundwater withdrawals. Pennsylvania’s Wetland Protection Action Plan (1997) set forth an agenda for the state to strengthen its wetlands protection programs by increasing public awareness about the importance of wetland resources and by identifying opportunities to improve regulation, policies, and programs. Since then, there has been a net annual gain in wetland acreage in the state, due in part to education, regulations, and improved technologies in wetland identification. Property owners who have wetland areas may consider a few of the following ideas to protect this valuable resource. The simplest way to protect a wetland is to do nothing! 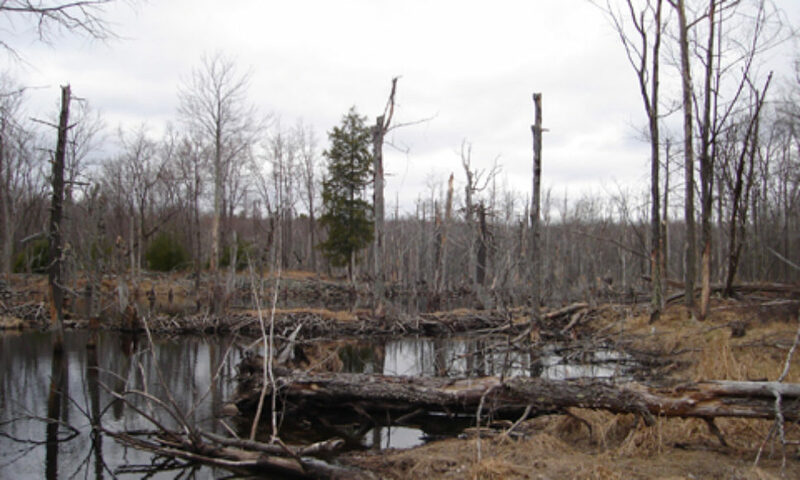 Be aware how land use or hydraulic modifications outside the wetland boundaries can impact wetlands. Vegetative buffers or greenbelts around wetlands serve as a visual and noise barrier to the interior of the wetland, which benefits wildlife. These buffers also slow the velocity of over-land stormwater, take up excess nutrients, and prevent erosion to the wetland allowing the water to percolate slowly into the ground. Stormwater runoff from pavements and other hard surfaces can increase the quantity and decrease the quality of water entering wetlands. Reducing these impervious areas and increasing the vegetated areas surrounding the wetlands, or providing a grass lined swale for stormwater conveyance will prevent erosion, take up excess nutrients, and trap sediment before entering the wetland. Reduce your use of pesticides and fertilizers. Perform a soil test to determine how much fertilizer is needed. Read and follow label directions for application. Better yet, explore organic or natural methods of insect and weed control and fertilization. If your wetland is adjacent to a waterbody, establish no wake zones to prevent wave erosion from boats. Do not ride off road vehicles such as ATVs and dirt bikes in wetlands to avoid damaging soils and vegetation. If you must cross streams or wetlands, vary where you cross to avoid impacting the same area repeatedly. Livestock should be fenced out of wetlands and stream areas. If the wetland is large, fence the overly used areas to protect water quality, prevent erosion and sedimentation. A single strand wire with movable posts may be all that is needed rather than woven wire fencing which can become clogged with debris during flood events. These are just a few of the ways you can protect wetlands on your property. Enjoy the benefits and natural beauty that wetlands provide for yourself and the next generation.